SNES Gradius III (JPN) in 29:20.6 by tviks. 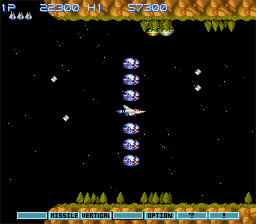 E. laser is used for the quick destruction of the bosses. Bonus stages were skipped for boringness and length. Choosing Arcade-mode in options takes a while because you have to press A-button rapidly for a short moment. This movie is similar in type to Morimoto's NES Gradius movie, except that Gradius 3 does not allow that many speed upgrades.